I had the privilege to style Zaha Hadid, the amazing award-winning architect who created the much feted Olympic Aquatics Centre and who was created a Dame in this year's Queens' jubilee birthday honours. The shoot for Hello magazine took place in her beautiful apartment in Clerkenwell where her open plan main room is like a contemporary interiors gallery - the whole back wall features one of her abstract paintings, the coffee table is a priceless creation in polished aliminium reflecting her study of liquid formations and even the condiments and candle holders are all works of art (see Hello, August 6th). 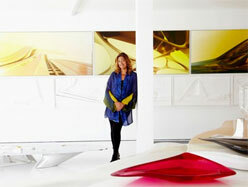 Zaha, who is a style legend in her own artistic launch time, loves cutting edge, sculptured fashion that reflects her architectural style - her wall to wall wardrobes include Prada cacoon coats (in different colours) and iconic creations from Comme des Garcons, Issey Miyake, Yohji Yamamoto and Ann Demeulemeester. Our rail for the shoot included intrinsically cut white shirt by Annette Gortz (left) and printed silk kimonos by Daisy Darche (above right) both from Fenwick. We also had Chalayan, Comme and Lanvin from Dover Street Market; curvy knits from Issey Miyake and Fortuny pleated silks from Patricia Lester. Later in the day, we shot at her new gallery around the corner from her apartment, featuring more of her amazing designs for interiors including stairs that float from one floor to the next. Zaha posed on a seat made by a huge wave of black that crests from one corner of the room. Here she wore a yellow and black printed silk kimono featuring her own print that reflects her flowing designs (right).